Here are 3 free GIF color changer websites. These websites provide different effects such as Grayscale, Sepia, Tint, and/or custom colors to change animated GIF color. You just need to upload GIF image from your PC and use available effects or custom color (if provided). All these GIF color changer websites also let you preview input GIF and output GIF, which is a handy feature. If the output is as per your expectations, then you can download it to PC. Some other great features like rotate GIF, edit images, crop GIF, add watermark to GIF, etc., are also available to use. Before I start the list, let’s see the original sample animated GIF added below. Now see the GIF below. As you can see, GIF color is changed. This is just a sample. You can try different colors and download the output GIF with a color that fits you the most. Let’s start with the first free online GIF color changer available here. Ezgif.com is one of my favorite websites. It is actually a whole suite of GIF images and whenever I have to edit GIF, I access this website first. It comes with GIF optimizer, crop feature, video to GIF, GIF splitter, reverse GIF feature, rotate GIF, and more. Adding effects to animated GIF is also one of its features using which you can change the color of GIF image. You can use presets like Sepia, Greyscale, Negative, Tint, etc., or set Hue, Saturation, Brightness, Contrast, and Lightness to change GIF color. An option to change GIF background is also present which lets you add a background color of your choice to animated GIF. In addition to all this, you can also use some preset filters like Lomo, Gotham, Toaster, Polaroid, Vignette, and Nashville to give some cool effect to output GIF. The best part is you can view input GIF as well as output GIF on the same page to have a better idea. When the output comes as expected, save it to PC with a single click. You can upload a maximum 35 MB GIF image, which is also a good feature. You have the choice to upload an online GIF or add it from PC. 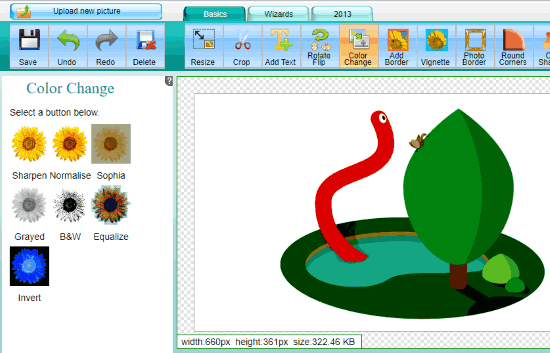 Online Image Editor is also a good GIF color changer. There are 7 different color effects that you can use to change color of animated GIF. You can convert original GIF color to Sophia, Normalise, Sharpen, Invert, Equalize, Grayed, and Black & White. Upload GIF from PC and then use “Color Change” option from the menu. After that, all the available color effects will be visible on the left section. Use any effect and view the changes in its interface. This is also a good feature as you are able to preview output GIF with selected effect. If you like the output, download it to your PC. Other than changing color of GIF image, this website brings many other features. For example, you can crop, resize GIF, add border to GIF, rotate and flip GIF, etc. The website doesn’t mention image size limit but I was able to upload more than 4 MB GIF easily. 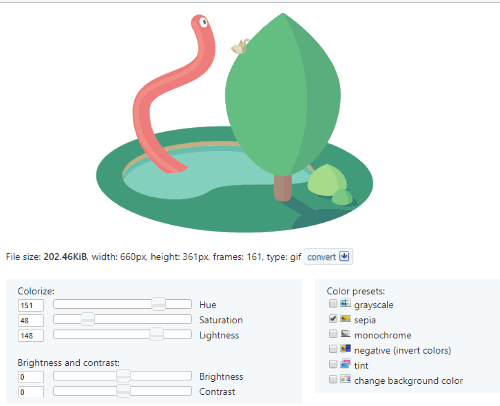 As GIFs normally come with few KBs only, so use this GIF color changer website without worrying about the size limit. LunaPic is another interesting website to change GIF color. 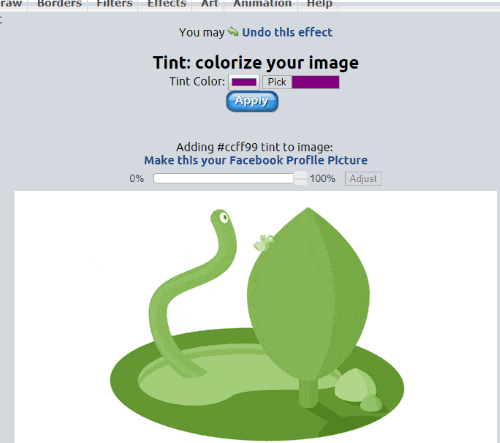 You can use its “Tint” feature to change animated GIF color. It gives a color palette which means you can select any of your favorite colors to apply to animated GIF. Select a color, apply it, and you can see the output animated GIF with the applied color. If the output is looking good, you can use right-click menu to save it. Or else, try other colors and see how the animated GIF looks. Like other websites covered here, this online GIF changer has other features also. You can remove objects from photo, apply filters to an image, add borders, and more. Here I close this GIF color changer list. All websites are good as per my opinion. Still, my preferred website to change GIF color online on this list is “Ezgif”. This website is always my first choice when we talk about GIF editing. You may give a try to all these online animated GIF color changers and share which one you like using the most in the comments section.